For pharmaceutical tablet producers looking to reduce waste, costs and increase production volume, a high efficiency rotary tablet press is the ideal choice. The latest technology allows for a high level of accuracy and automated quality control, meaning continuous production with little user input required. The Sejong Pharmatech P210S rotary tablet press is a high performance machine available in a range of output capacities up to 158,000 units per hour. This flexible machine can produce round or oblong tablets up to 25mm in diameter/length and up to 8.5mm thick. The P210S offers a press pressure of up to 6,000 kgf, providing optimal compression results and minimising formation faults, yet the machine only has a small footprint of 800mm x 1300mm. 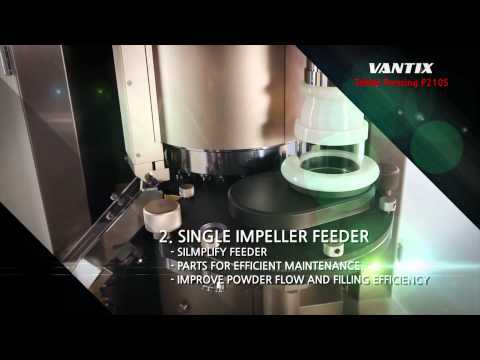 Advanced features include a turret-type disk interchange system for quick and easy changes to dosage form, and a single impeller feeder that simplifies cleaning and maintenance yet improves powder flow, increasing the fill efficiency and therefore improving throughput. P210S also features a fully automatic discharge chute with three-position operation for good, reject and sampling. A newly enhanced compressions roll and dust collection system minimises powder leakage, and the optional integrated weight control system allows independent control of weight and hardness. The user-interface is a fully graphical touch screen type for ease of use, and the system offers full 21CFR part 11 compliance for regulatory recording. Sejong Pharmatech (http://www.sjpmt.com/en) has about 30 years of accumulated know-how excellence in making high quality and innovative pharmaceutical machines. Sejong Pharmatech is an experienced manufacturer of high quality and innovative pharmaceutical machines.